My goodness, people, you certainly love broccoli! If you haven’t had the chance to read this piece on broccoli, go there now. Not so much for my writing  you can skip that. Jump right to the comments and see what the community of people reading here has recommended to each other. Roasted broccoli, broccoli soup, broccoli on top of brown rice for breakfast, and steamed broccoli with red onions, blue cheese, and cream to finish. I swear, I could make a dish based on your suggestions every day of the week and still be discovering new joys of broccoli for months on end. You see, one Wednesday, we’ll be offering up an ingredient and opening the microphone to your voices. The next week, we are going to share a recipe with that ingredient. It should keep the conversation going. It certainly keeps us intrigued. We were going to try one of your suggestions and post it as a recipe this week. Then Danny had to go and make our favorite winter slaw for lunch a few days ago, and throw in some broccoli. Little Bean ate an entire bowl. We talked about how much we love this recipe again. That was it. Here it is. I have to tell you, it has taken me all day to write this small piece. The news from Haiti has devastated me, as it has so many of us. Those images. Those children, without parents. Those parents, finding their children on the streets. It has been almost more than I can bear. So, I decided to share this recipe with you, here, today. Danny made the slaw for lunch again, while Little Bean stood beside him on a chair, banging a measuring cup against the counter. I took photographs of the slaw in the best light I could find, while Little Bean practiced walking up and down steps beside me, holding her daddy’s hand. We sat down to eat, music playing, while Little Bean sat chattering as she put Napa cabbage, brussels sprouts, and broccoli in her mouth. It may have been hard-grey raining outside, but we were together. Prepping the vegetables. Take off all the little florets of the broccoli head. Peel the outer layer of the broccoli stalks and slice them in half lengthwise, then dice them (about 1/2-inch cubes). Remove the outer layer of the brussels sprouts. Cut each Brussels sprout in half. Slice the halves as thin as you can. (You could use a mandoline here, but you dont have to do so.) Cut the Napa cabbage in half. Remove the core and slice as fine as you can. Slice the celery down the middle, lengthwise, then dice the celery stalks the same size as the broccoli stalks. Combine all the vegetables in a large bowl. Making the dressing. Mix the mayonnaise, mustard, and rice wine vinegar. Season it with salt and pepper to taste. If you want the dressing a touch thinner, add a bit more vinegar or a smidge of water. Finishing the salad. Coat the vegetables with the dressing. Season the salad to your taste. Danny says, “Have a nice day.” Also, if you want to learn how to make homemade mayonnaise, we’ll have a video up in the next couple of days. Woe is me. I was gone all week in the mountains with no internet or cell service. I must catch up on the news, or… do I want to? Thanks for the slaw and the beautiful prose as always. Brilliant – thank you for this. I'm trying to eat more vegetables of the broccoli/cabbage variety, and was stuck in the post-holiday habit of crisping up my Brussels sprouts with altogether too much bacon. Yum. Wish I could eat mayo (no eggs in my life). Looks and sounds really yummy though. Shauna, when is your cookbook coming out?? I know you've talked about it, but I can't seem to find where you've mentioned it. I keep telling people about you and the upcoming book, but I don't know when to tell them to look for it! Oh my gosh, this reminds me of a fabulous broccoli salad I had! Except it had raisins and sunflower seeds as well (those seeds are brilliant in that just so you know =D). This is EXACTLY the type of broccoli recipe I have been looking for…I am so making this this weekend thanks!!! I grew up hating slaws of all kinds, but recently my taste buds have changed and now I can't get enough! I love the idea of using broccoli as a base, I cannot wait to try it out! Love "slaw" based recipes with avo and homemade dressings instead of homemade mayo. All those lovely cruciferous veggies are excellent anti-cancer foods! Mayonnaise can be made using nut paste as a base instead of egg yolks. Google for eggless mayo recipes – you'll find tons! I am definitely going to make this this week! It looks amazing. Elena over at http://www.elenaspantry.com has a really good recipe for Marcona Almond Mayo. Hope this helps. This salad looks delicious. Thank you for inspiration. I love broccoli. This recipe will be tried as soon as possible! It looks delicious and very worthy of the extra effort to make homemade mayo for it! Thank you! I had no idea that this is what I've been craving for days. Thank you. I know what I'm having for dinner tonight! I have a real aversion to the taste of mayo. Does nut-based mayo taste like the regular stuff? i admit it. I buy the broccoli slaw already made up from the shop and toss my own dressing. your recipe, as usual, is so simple and lovely, I will make my own this week! Yum. I love broccoli, but sometimes I don't know what to do with it in terms of preparing/cooking it. This looks like a good option. I'm not a fan of mayo, though, so I'll need to devise a different dressing. That sounds absolutely delicious. Thanks for sharing. I am in my slaw phase… just tried carrots and red cabbage the other night… so will definitively try this one soon! I'm going to make this tomorrow! I'll be interested to taste it! As far as the Haiti news…I know that I look at my life today and realize how blessed I am and that everything for me is a "luxury problem". I know I will reach out and help in some small way at least. Question. I'd eat this slaw all by itself, but I'm wondering what I could serve it with when friends come over. ???? I love that quote… I also felt strange writing about dessert when all that is going on practically next door to me. But food and cooking, with humility and the spirit of sharing are great gifts to the world. They bring people together. Such beautiful post. I found your blog due to googling out of food "boredom." See, I'm an allergy case. Asthma, Eczema, Sinus. I've got it all, thought I was stuck with it too. Until my doctor told me I've been lied to by the medical profession and it's really all down to food sensitivities. WHAT? You mean I don't have to use a pump every morning and night just so I can breathe like a normal person? I don't have to take tablets that make me fall asleep just to stop sneezing? Post Nasal Drips aren't supposed to be a part of every day life? I had to do a two week food diary for him, that included any symptoms I might feel. After looking at it, he said the top contenders were wheat and dairy. And then he put me on the restrictive diet of all restrictions! I feel like I'm living off fruit and veg! With a bit of meat and potato thrown in every now and then. It's only been five days, but gosh its boring. My husband of 30+ years was diagnosed with Celiac 6 months ago. I found your blog and started to check out the bakery recipes because most of the store GF products were less than stellar. I then got your book which really helped me to understand the process of becoming GF. Now I check out all of your recipes because the ones you find that work for your family seem to work for us. Thank you so much for saving us, helping us to find good food and to stay grateful and cheerful. Yum! I made this slaw but tweaked it a little. 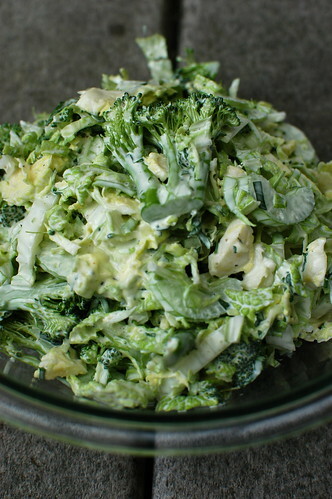 I didn't have brussels sprouts or cabbage…so I used escarole, the celery and I blanched the broccoli- raw broccoli can be a little too rough for me! Anyway, thanks for the inspiration!! It turned out dee-lish! This looks amazing!! Can't wait to make it. Is there a particular brand of Dijon mustard that should be used or is Dijon mustard gluten free? Also, is there a particular mayo recipe or just look one up? I too am curious when the next book is coming out!! Cant wait!!! Thanx! This was just amazing. I even had some leftover homemade mayo waiting in the fridge, so it was quick too! That picture made me drool at work, so we had this for dinner last night. Unbelievable. And I didn't even have any cabbage. Just used sprouts and broccoli. Still wonderful!!! I've been waiting for the weekend to make this. Can't wait!! I think even my celery hating husband will like it! I love broccoli too! And we definitely don't make enough of it! Looks very tasty. I always enjoy your posts–and your recipes–but this salad is delicious! I just made it this afternoon as part of my husband's 30th birthday feast (30 dishes with a BBQ theme–only he could devise such a thing), and I'm sure it will be a hit tonight. The homemade mayo is a plus…thanks for the inspiration! We use the Follow Your Heart mayo, it is egg free and vegan. I can't really tell a difference between it and regular. Thank you for bringing my children back to the veggie side! This recipe was my introduction into your blog! It was so good that I made it again the next day, and have become an avid reader of your blog despite not having any gluten issues in my household. Thanks for writing! Thoroughly enjoyed this! It works great as a “salad” dressing, too. Since I don’t like brussel sprouts and needed something to fill in the gap, I used what we had – lettuce. It got great reviews. For people who don’t like vinegar and can taste it in everything, though, is there any alternative? I love the mayo taste, since mine is pretty good and wholesome, and its the perfect thickness. But what else could work well with this (and other dressings) instead of vinegar? Is there any hope for the vinegar-adverse?? ?